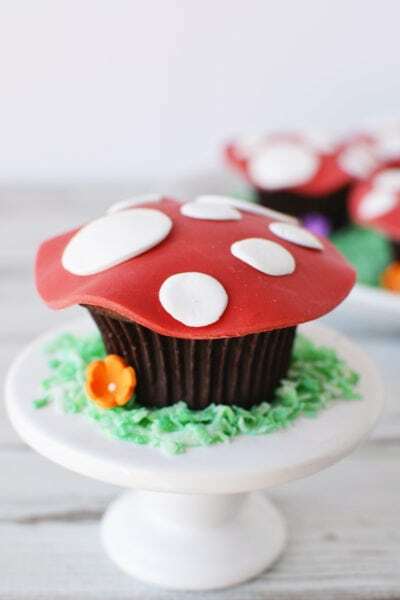 When it comes to fun date night ideas, the pressure to come up with something creative and unique can be immense. Whether it’s a first date or the hundredth–or even just a “date” with friends–Pinot’s Palette is it. 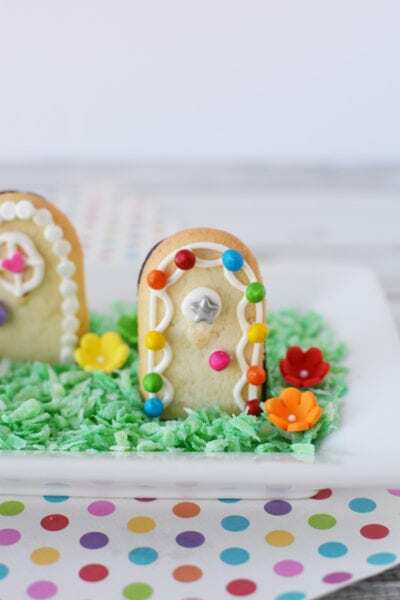 It’s the perfect combination of festive, low-key, fun, and an event you’ll always remember. 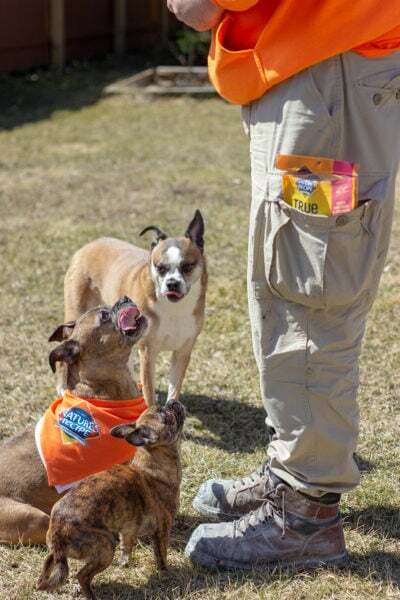 This is a sponsored post, but everything shared here is based on my experience. We’re all typically glued to our smartphones even when we go out. If it’s a group of us or even a date night, there are usually several moments where each person is caught with their face in a screen. 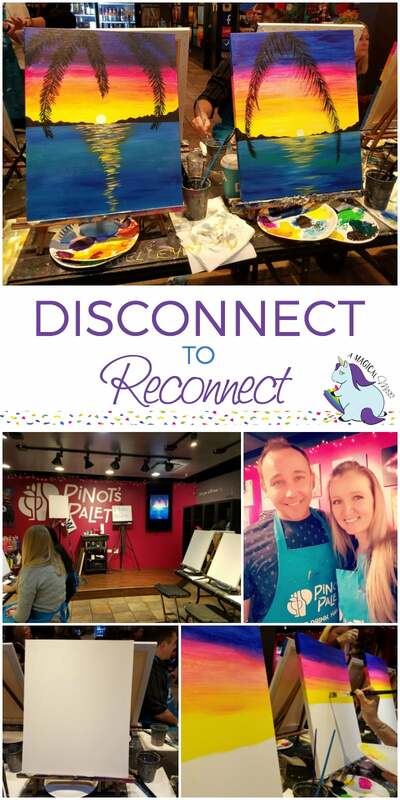 Well, at Pinot’s Palette, you’re fully able to disconnect to reconnect. For this fun night out, I brought my brother, Rudy. 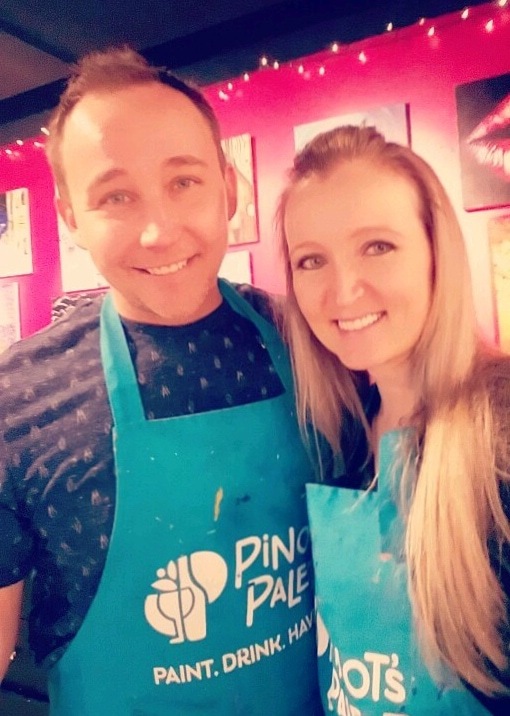 Neither of us had ever been to a paint night, and it was a step out of our comfort zone–not in a bad way–but in a let’s try something new way. As soon as we walked into Pinot’s Palette in downtown Naperville, we knew we were in for a fun evening. The atmosphere was buzzing with excitement and energy. There were large groups of women there for girl’s night out, and several groups of two, obviously on a date night. Everyone was friendly and excited to start painting. I haven’t painted in years, and aside from rolling walls, my brother hasn’t painted since probably preschool. I could tell he was a little uncomfortable at first because he likes to master everything he does. Luckily, with the instructions given by our excellent host, everyone in the room looked like a master by the end of the evening. Having a cocktail to loosen up helps too. 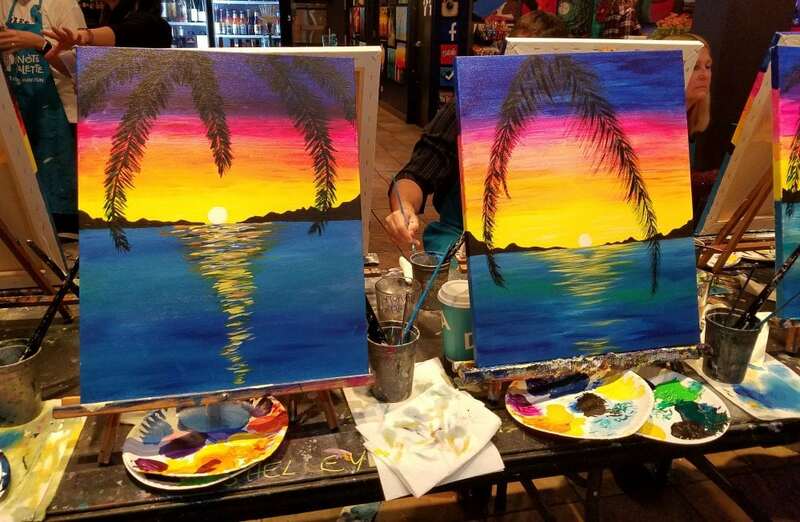 Paint and Sip is the way to do it! 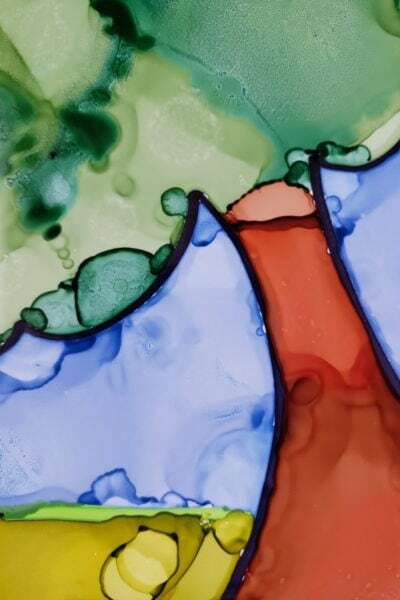 The instructions for the painting are super easy to follow, and you have complete creative freedom to do your own modifications. There is a scheduled break during the paint-time so you can use the bathroom, get another drink, and mingle. Music is playing in the background at just the right volume–it’s loud enough to pump you up, but not so loud that you can’t talk to your neighbors. Throughout the evening I kept looking around at all the people and their paintings. I found it fascinating that we were all given the same colors and instructions yet each piece was unique in its own way. Rudy and I are naturally quite competitive. Siblings, duh. But even he and I were pleasantly surprised with how different our methods were and how the final result turned out. We laughed, got super serious about our work, laughed some more–because there were times we were both so focused on our work we forgot we were in a room full of strangers–and overall had a blast. It was an evening we’ll never forget. The only time either of us used our phones was to take pictures of our masterpieces. I can’t remember the last time Rudy and I were so present. 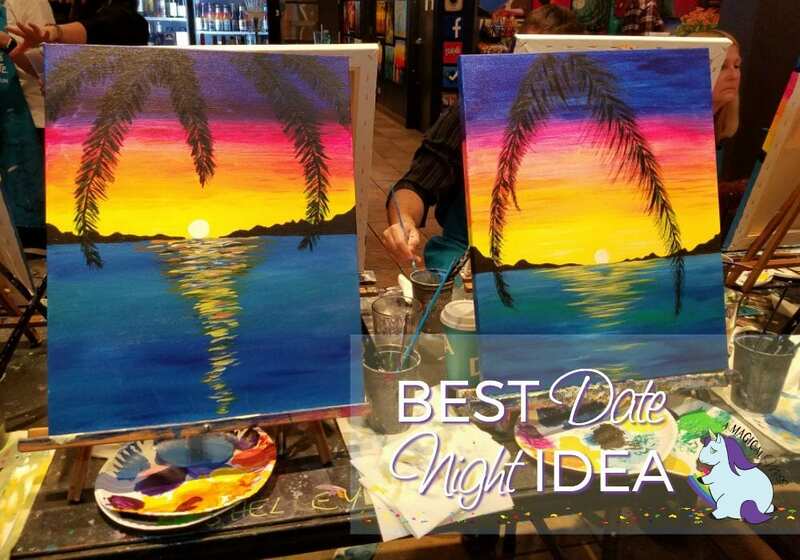 We are each adding Pinot’s Palette to number one on our list of fun date night ideas. Since we’re both single, we said we should double date here! Can’t wait! 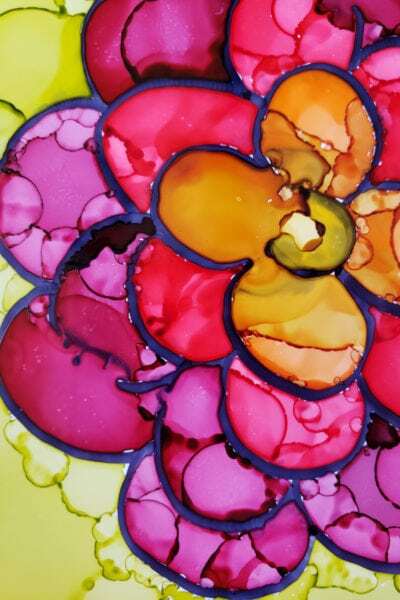 Visit Pinot’s Palette and let us know which painting you would pick! 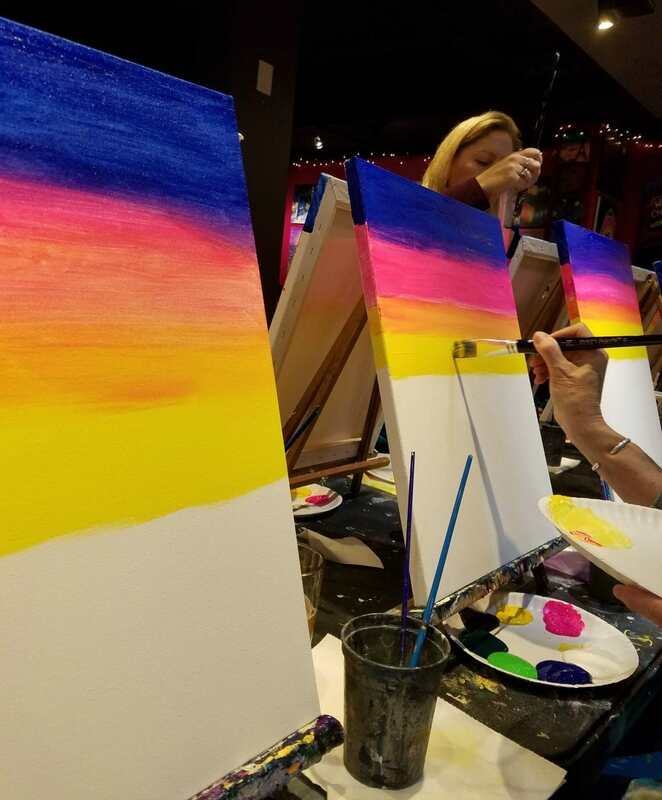 Is Pinot’s Palette on your list of fun date night ideas? 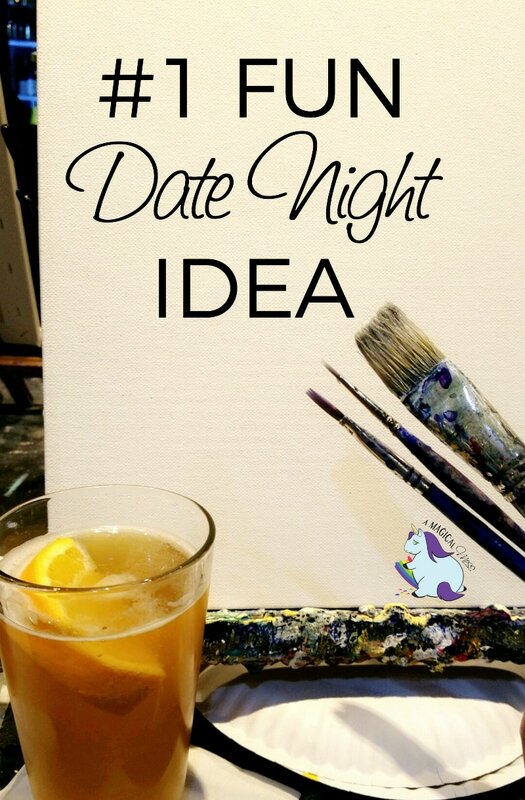 This really is an awesome idea for a date night with your spouse, friend or sibling! I love having an activity for the evening! You both did an awesome job and have a fun moments of the night! That looks like a very fun way to spend an evening. 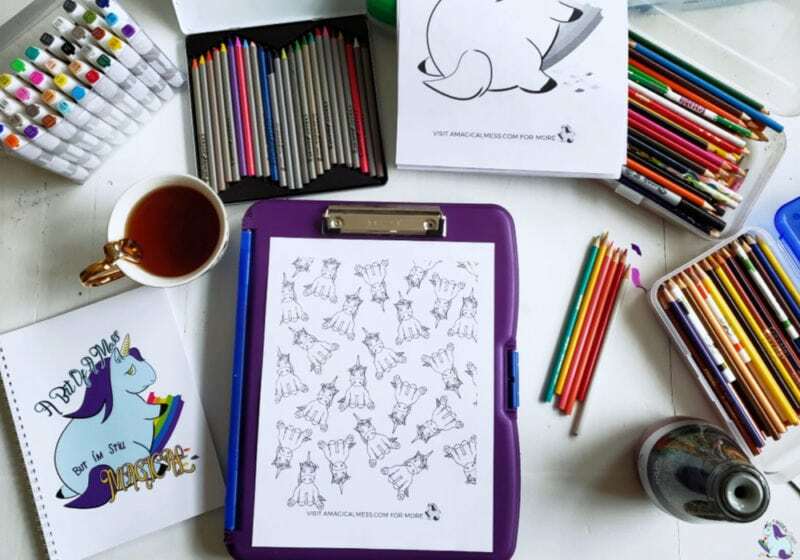 How cute and fun that would be, and you could hang your art too! I love the pictures that were made! I think this is a great idea and a super fun night.